SREBRNA Apartments has been created for those who appreciate comfort, safety, comfort and, at the same time, privacy. Undisturbed surrounding and convenient location are additional attributes in favour of our proposal of 6 comfortable, fully equipped apartments as an excellent alternative to hotels or boarding houses. 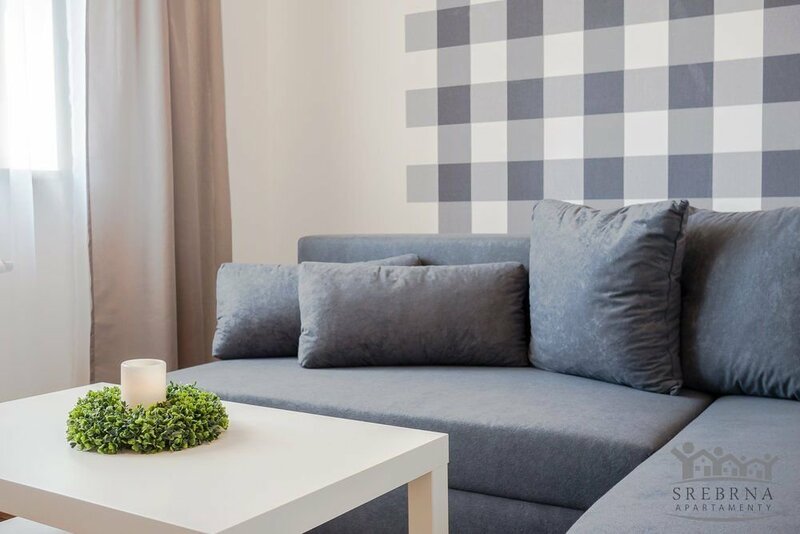 SREBRNA Apartment are new, independent, luxuriously furnished apartments with the total area of 35 m2 to 50 m2 with their own bathroom, fully equipped kitchen or kitchenette and a room. The apartments are arranged in such a manner so as to ensure the guests with a pleasant stay in comfortable conditions. Additionally, we offer free cleaning service and change of bed linen and towels. Free internet and cable TV is installed in each apartment. The facility where the apartments are located is monitored, fenced and equipped with door entry kits which guarantees the guests a feeling of safety. The apartments on the ground floor have a terrace with a direct entrance to the garden and the apartments on the first and second floor have a balcony. All apartments located on the second floor are equipped with air-conditioning. The guests also have at their disposal a fenced and monitored car park for free. An advantage of SREBRNA Apartments is also their favourable location. A convenient location of Pszczyna at the crossing of many provincial and national roads will allow our guests to rapidly reach Katowice, Bielsko-Biała, Czechowice –Dziedzice or Jastrzębie-Zdrój, Rybnik, Tychy and Kraków. The SREBRNA apartments are located on a quiet and peaceful housing estate. A supermarket, cash dispenser, pizzeria, a Roman Catholic church, schools, a kindergarten and football pitches are in their vicinity. Additionally, the apartments are located close to a 9-hole golf course. The location of the apartments is also favourable due to many tourist attractions of Pszczyna, especially due to the Castle Museum with the adjoining historical park of Pszczyna and the Old Town, as well as the Bison Pen, Open-Air Ethnographic Museum-Farm Village of Pszczyna and Press Museum. You are warmly welcome to our SREBRNA Apartments if you are interested in our long-term rental!